Note: Cathy is still on Sabbatical and will return March 2018. Until her return, Louise is managing the blog. Approximately sixty-five million years ago, a massive asteroid, “roughly six miles wide, smashed into Earth, sending iridium around the globe and the dinosaurs to their death.” Is it possible another asteroid is headed towards Earth and could end life as we know it? In this latest entry in the very popular Scientists in the Field series, award-winner nonfiction writer, Elizabeth Rusch investigates the probability of an asteroid colliding with Earth and what can be done to prevent it by interviewing scientists who study them. There are also scientists, and amateurs, who spend their evenings scanning the night skies, looking for moving objects that could be potential asteroids. The key is discovering whether its orbit is on a collision course with Earth. With this knowledge, scientists are making plans to destroy any asteroid on that trajectory. As with all books in this series, the writing is engaging and loaded with side bars giving more information on topics discussed within the text. Each page is illustrated with well-captioned, color photographs by Karin Anderson that mirror the text. Back matter includes a bibliography, glossary, source notes, and index. What I liked is the What You Can Do! 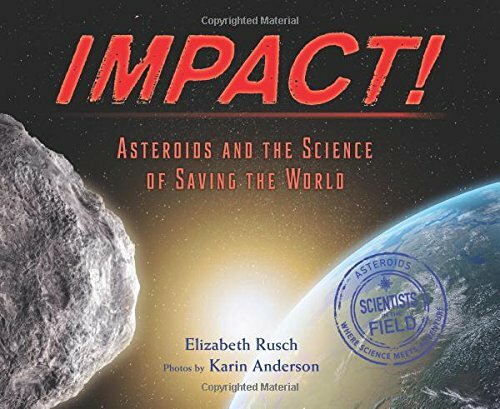 section that encourages readers to get involved in discovering, tracking, spotting an asteroid as a flash in the sky, tips for collecting meteorite fragments, and also helping NASA come up with ideas on how to search and destroy (or Deflect) an asteroid. For science lovers of all grades, because of the chapter on how dinosaurs became extinct would make this book an easy sell to those who love anything about dinosaurs. Just read this a couple of weeks ago & loved it! So much interesting stuff and very fast-paced.